Many street food stalls in Bangkok that look like Tom Yum Goong Banglamphu (ร้านต้มยำกุ้งบางลำพู) serve pretty average, typical Thai food. 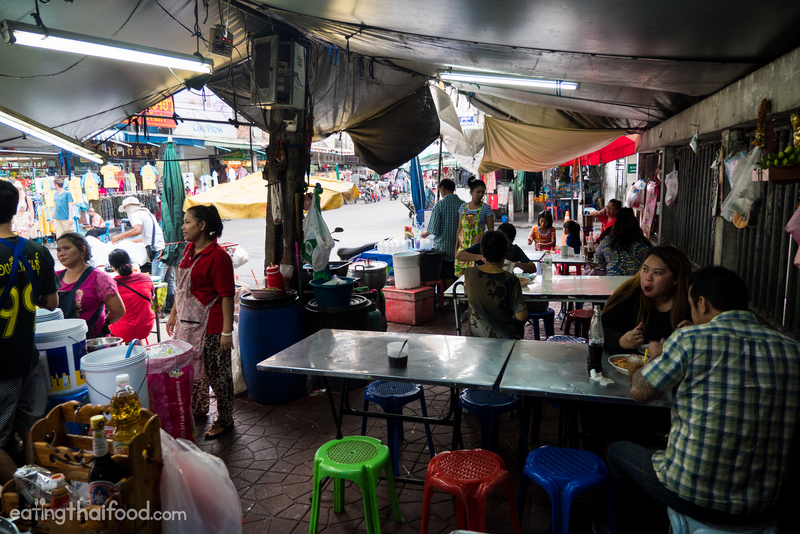 But Tom Yum Goong Banglamphu (ร้านต้มยำกุ้งบางลำพู), a well weathered street food stall just two blocks from Khao San road, located on the sidewalk outside of the main Banglamphu car park, is a street food stall that produces some seriously glorious shrimp dishes. The dish they are most well known for: tom yum goong (ต้มยำกุ้ง). Ying and I had this idea to go around and explore Bangkok for 2 weeks straight and do as much, and eat as much, as we could for a full 14 days (videos coming soon). We started out in Banglamphu, which is an old area of Bangkok, and one of the best areas in Bangkok for food in my opinion. We even decided to stay at a hotel, called Full House Khaosan (highly recommended place to stay by the way), just a stones throw from Khao San Road, and just around the corner from a street food stall known as Tom Yum Goong Banglamphu (ร้านต้มยำกุ้งบางลำพู), on Soi Kraisi. 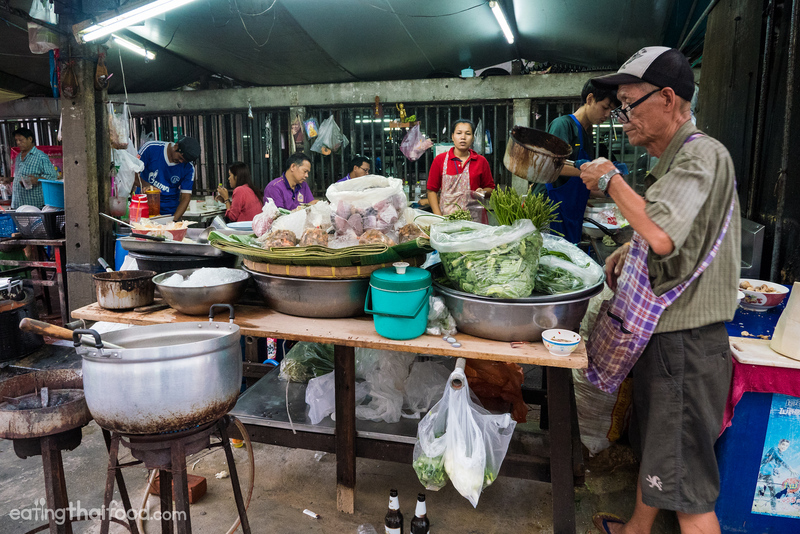 I’ll be straightforward when I tell you, it definitely won’t be the prettiest display of freshwater shrimp and seafood ingredients you’ll ever see at a Thai street food stall… but it definitely has some character. 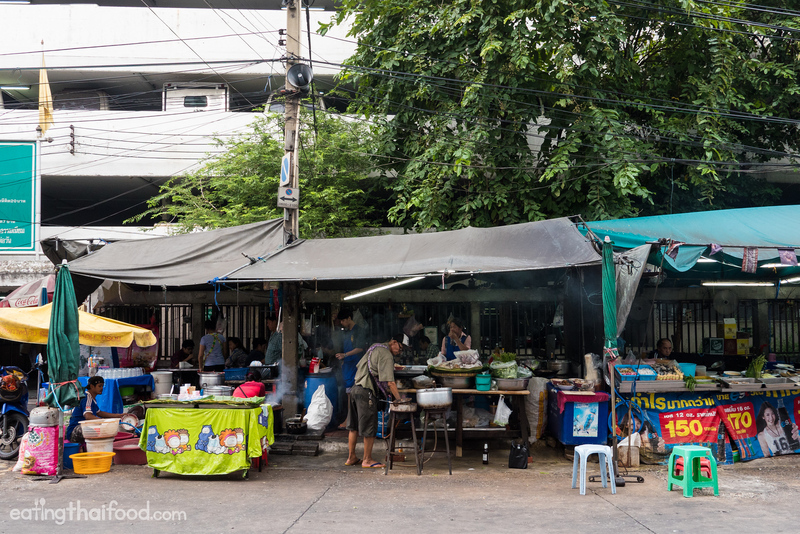 The restaurant sets up along the sidewalk, along Soi Kraisi, and at the front of the sidewalk is where all the cooking takes place. There are about 5 or so tables behind the kitchen, where you can grab a table, sit down, and order. I didn’t see any menu at the restaurant, so it could be a bit tricky to order without speaking Thai. But they definitely have tom yum goong (ต้มยำกุ้ง) all the time, which is the main dish to order. It’s a family run food affair at Tom Yum Goong Banglamphu (ร้านต้มยำกุ้งบางลำพู), and from what I noticed and observed while eating there, it looked like Uncle handled the tom yum goong (ต้มยำกุ้ง) and most of the salads, while Aunty handled the stir fried and deep fried dishes. To get things started, we began our meal with a plate of simple pad pak kana (ผัดผักคะน้า), stir fried kai-lan with oyster sauce. The flavor was pretty good and as you can expect from most Thai street food stalls – it was nice and salty, with a good garlicky flavor. It was also stir fried on high heat so it remained crisp, yet lightly wok stir fried. I didn’t know the price until we paid, but f0r 60 THB, it was quite a high price for just a place of pad pak kana (ผัดผักคะน้า), but luckily the other dishes made up for it. 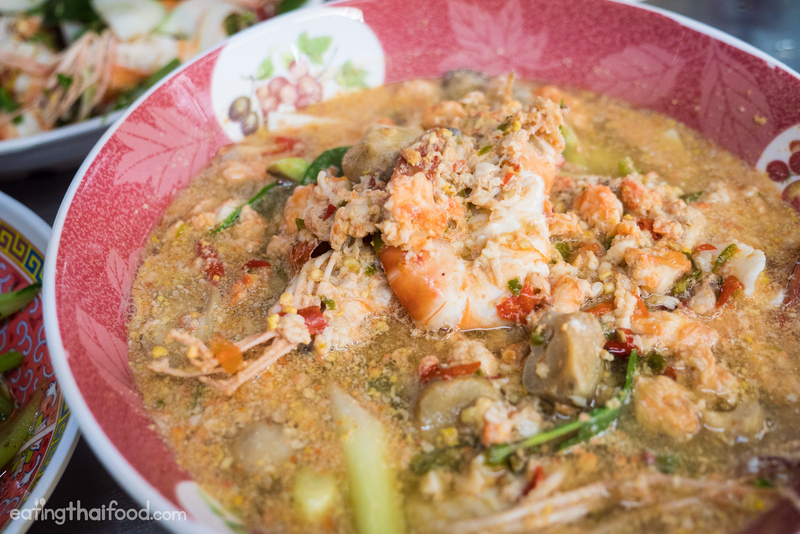 The main reason to eat at Tom Yum Goong Banglamphu (ร้านต้มยำกุ้งบางลำพู) is for the tom yum goong (ต้มยำกุ้ง) – it would be terrible to go there and not eat it. At the front of the restaurant they had a big pot of broth with a bunch of herbs floating around, which was the stock for the tom yum. 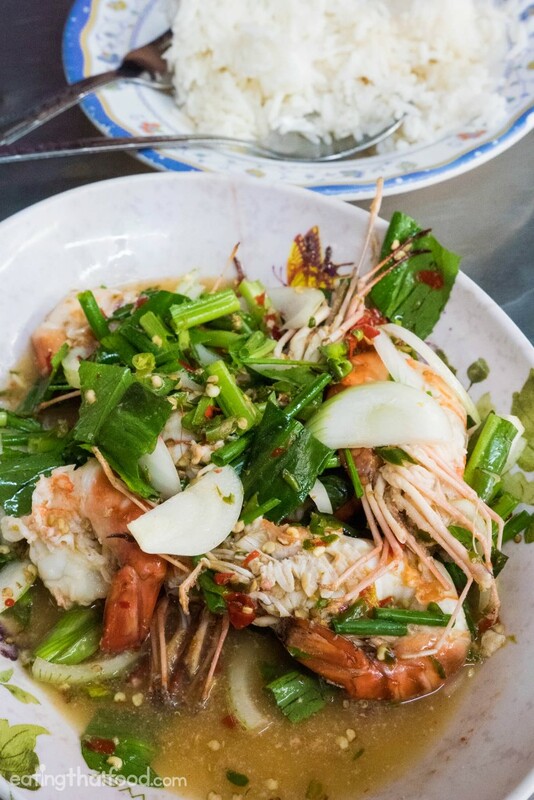 As soon as they received an order, Uncle would grab a pot, scoop in some of the soup base, fire it up on a burner, add in a bunch of lemongrass, galangal, kaffir lime leaves, crushed Thai chilies, a few mushrooms, coconut shoots, and finally the incredible freshwater shrimp. The tom yum goong (ต้มยำกุ้ง) arrived at our table, and to me it almost looked like a curry rather than a soup – it was so thick and so creamy. And what’s ever better, rather than adding any evaporated milk for creaminess like many street food stalls do these days in Bangkok, at Tom Yum Goong Banglamphu (ร้านต้มยำกุ้งบางลำพู), all that creamy fatty butteriness, all came from the freshwater shrimp, the way it should be. The broth of the tom yum goong (ต้มยำกุ้ง) was extremely rich and buttery, and it had a wonderful aromatic aroma of lemongrass and galangal. It was pleasantly sour from lime juice, and also what I really liked was that they included a handful of what I think were julienned coconut shoots, which are similar to bamboo shoots, but more crisp. Finally, let’s move on to the freshwater shrimp, one of my favorite things in the world. What I loved most about the shrimp was that they weren’t overcooked. 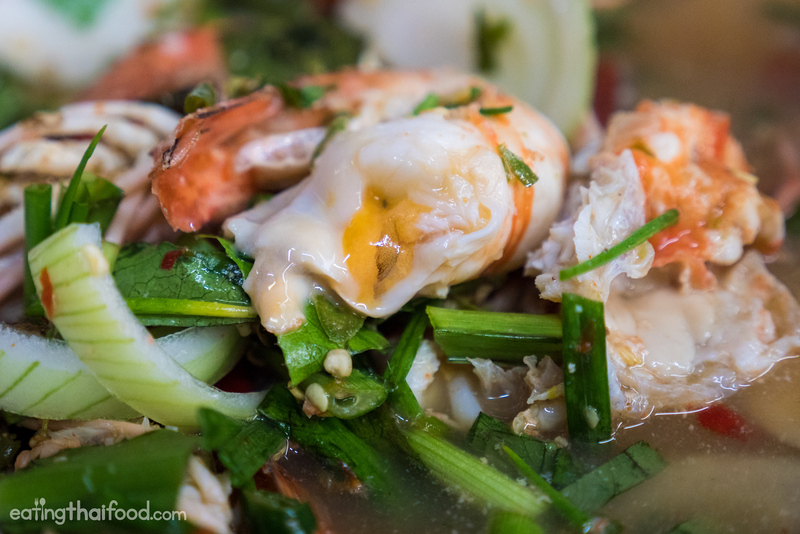 One of the worst things about tom yum goong (ต้มยำกุ้ง) is getting a bowl where the shrimp are overcooked, with no flavor and a rubbery texture. 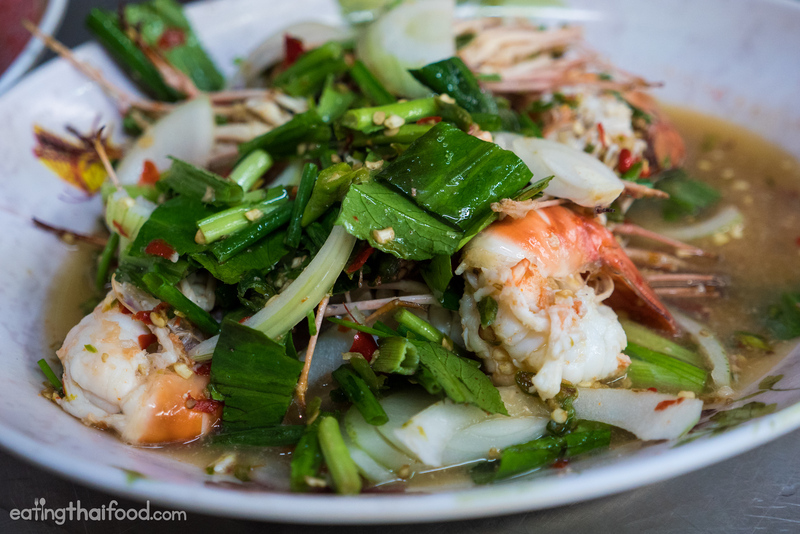 Since they specialize in shrimp, they made no mistakes at Tom Yum Goong Banglamphu (ร้านต้มยำกุ้งบางลำพู). 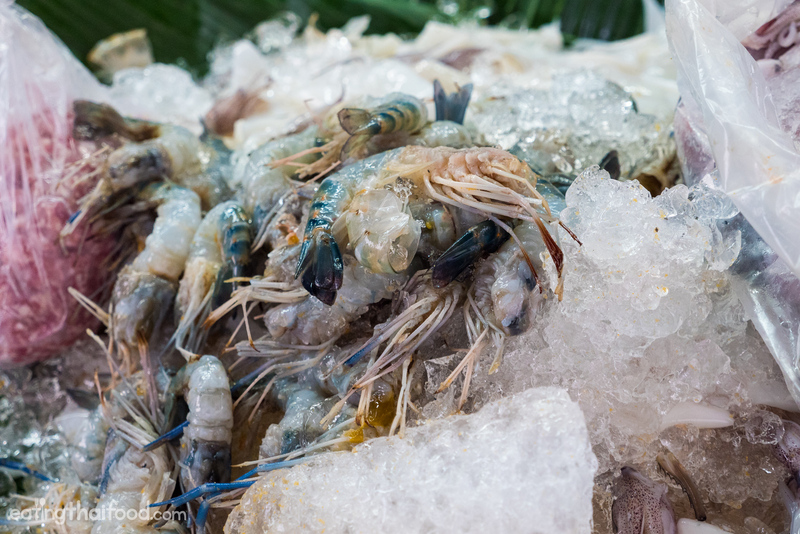 The shrimp were medium sized, not the extreme jumbos like in Ayuthaya, but still impressively big. That buttery goodness from the shrimp! They were unbelievably juicy, to me they tasted 3/4 cooked, so they were fleshy, yet still moist and juicy all the way through. After puling off the heads of the shrimp, the yellow fatty liver was still oozing like an egg yolk. Amazingly delicious. The blend of the shrimp with the sour spicy soup was marvelous. I’m still debating to myself whether I liked the tom yum goong at Mit Ko Yuan (ร้านมิตรโกหย่วน) better or the one here. My wife says here was her favorite, one of the best she’s had in a long time. Either way, it’s a delicious debate to have. 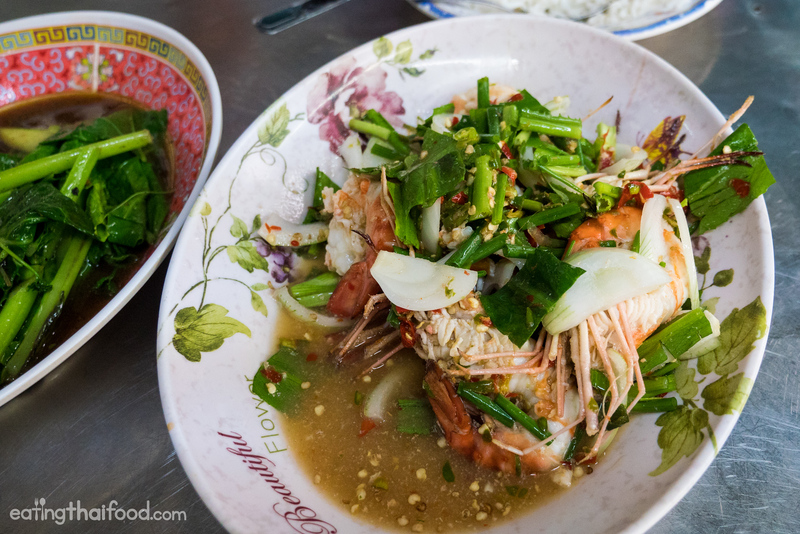 One of my favorite salads in Thailand is pla goong (พล่ากุ้ง), a shrimp salad that’s usually packed full of herbs and chilies, and dressed in a number of different ways, in lime juice and fish sauce being my preferred method. Using the same freshwater shrimp as used in the tom yum goong (ต้มยำกุ้ง), this time Uncle cooked them slightly, then added in a few heaping handfuls of herbs, including a ton of roughly cut green onions, white onions, sawtooth herb, and crushed Thai chilies, and then mixed in a strong lime juice and fish sauce dressing, with perhaps just a touch of sugar to balance the flavor. It was also a little soupy, I think they may have added a spoonful of broth to the salad as well. That yolky goodness of the shrimp! Again, the freshwater shrimp were cooked perfectly, not overcooked at all. They flesh of the meat was silky and slightly slimy, and as soon as I removed the head, you could see that beautiful yolk liver of the shrimp. The pla goong (พล่ากุ้ง) had a really good taste as well, nice and sour, salty as most street food is, and then just packed full of herbs. 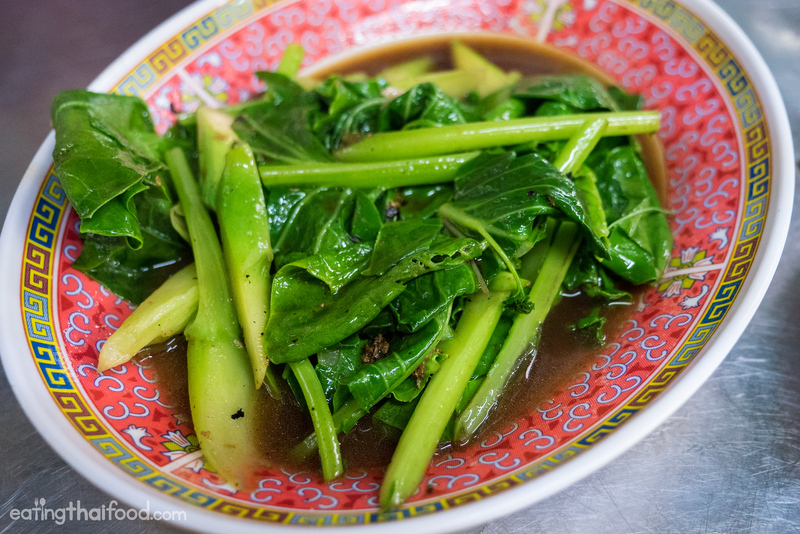 The sawtooth herb in particular gave the pla goong (พล่ากุ้ง) a lovely earthy green flavor, while the chilies were nice and spicy, and were those types of chilies with a sour tinge to them. The pla goong (พล่ากุ้ง) definitely wasn’t the most refined or pretty version of the dish I’ve had, but it sure tasted incredible. 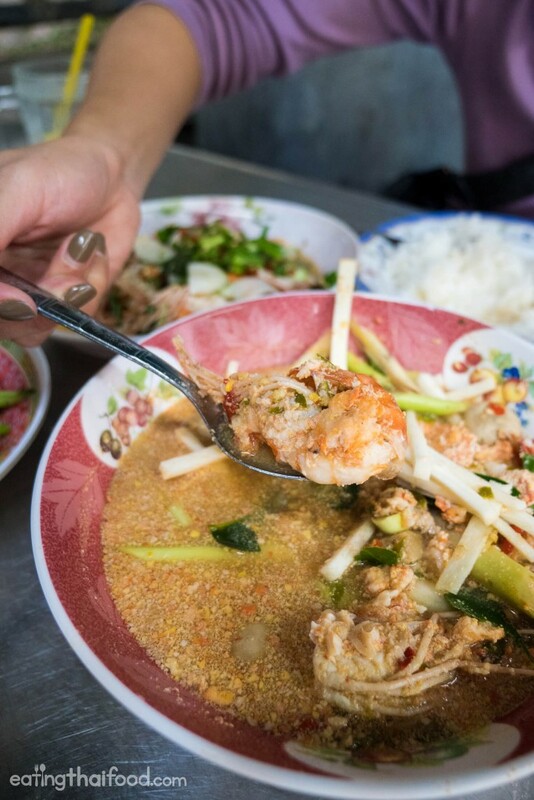 Tom Yum Goong Banglamphu (ร้านต้มยำกุ้งบางลำพู) is a Thai street food stall located just a stones throw from Khao San Road in the Banglamphu area of Bangkok, that specializes in shrimp. 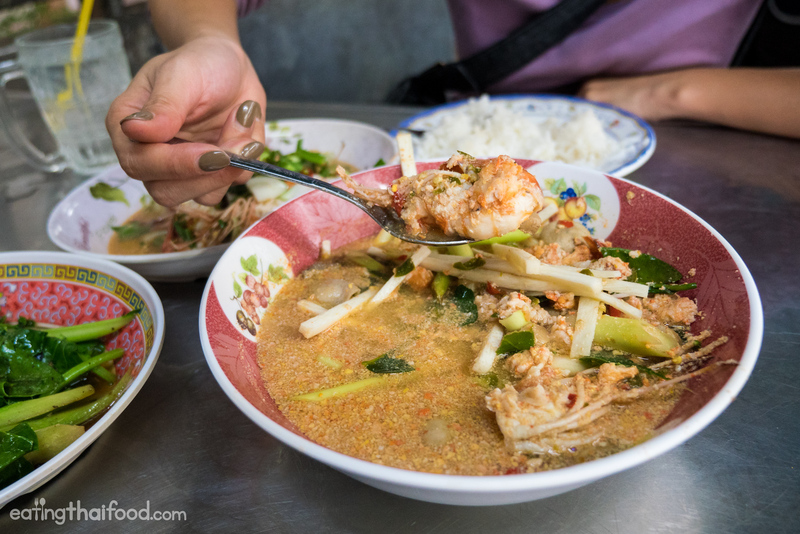 Although it’s not the prettiest of street food stalls in Bangkok, they manage to pull off one of the ultimate versions of Thai street food style tom yum goong (ต้มยำกุ้ง) in the city. I also tried the pla goong (พล่ากุ้ง), a shrimp salad full of herbs and dressed in lime juice and fish sauce. It was also delicious. As much as I wanted to order a third shrimp dish, since it was just Ying and I eating, we made the call that three shrimp dishes of this magnitude would be a little too much for just the two of us. So unfortunately as much as I wanted to try the goong tod gratiem (shrimp fried with garlic), which looked insanely good, we didn’t try it. So that will have to wait for next time. เปิดบริการทุกวัน 9.00 – 18.30 น. 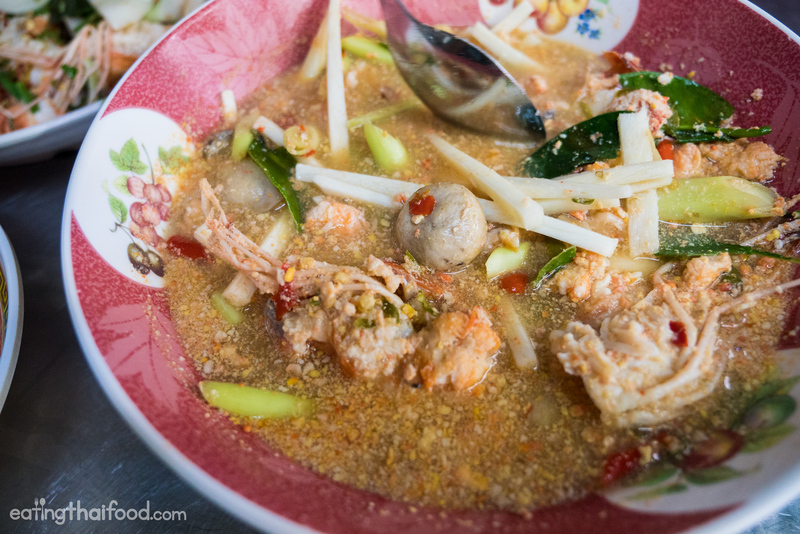 How to get there: Tom Yum Goong Banglamphu (ร้านต้มยำกุ้งบางลำพู) is located just outside the car park garage, on Soi Kraisi, just two roads down from Rambuttri and Khao San. 47 comments. I'd love to hear from you! 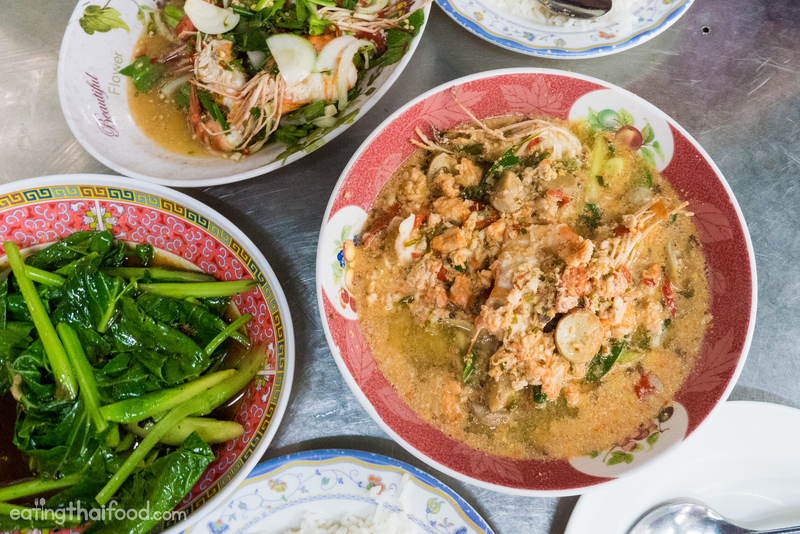 My top three tom yum goong in Bangkok: Tom Yum Goong Banglamphu, Pe Aor and and Mid Ko Yuan. And Mark, the owner of Pe Aor told me he had changed the recipe a little bit because it was too spicy for most tourists. And all the tourists visit Pe Aor because of your blogs/vlogs. Still highly recommended though! 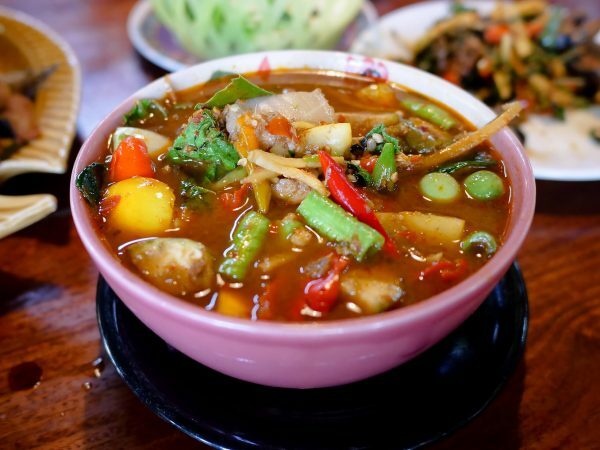 For all the food lovers in Bangkok, try TopTravelFoods app to find Bangkok’s must-try dishes! Hi Mark. Your link to Mit ko yuan restaurant does not work. Same issue on a few on your chiang mai post. Just to let you know :) amazing job and thanks again for the hard work! Thanks for the blog Mark. My family and I ate here today Aug 2018 and it was fantastic. We loved Bangkok so much we are returning in February and will be here for a feed! 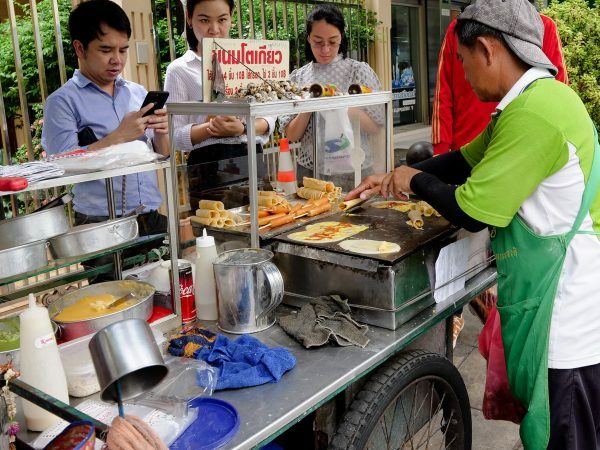 Mark with the recent street food ban, what is the fate of this stall??? Hi, how to go there by BTS? Hi Mark, I saw another recording of when you went to Tom yum goong banglampu and you ordered garlic prawns. Can you tell me how to order that dish in Thai please? Hey Jina, awesome to hear from you, wow, that’s great that you made it here. Still what I consider the best of the best tom yum. Mit Kho Yuan is a different style, but it’s good as well. Enjoy! Hey Mark, My friends and I are in Bangkok for the next few days. Was wondering if you would like to go around and check out Bangkok together? I’ve loved watching your videos and would love for you to take us to these wonderful places. Thanks! Hey Angel, awesome to hear you’re in Bangkok. I don’t think I can make it this time as I already have some plans, but hope you have an amazing time and enjoy the food! Hey Mark, Just wondered if you would have time to meet up for a bowl of Tom Yum Goong. Ill be in the area in two weeks time. As a long time subscriber it would be an honour to share a table with you and it would make my trip to Thailand that much more memorable. Hope all is well, safe travels. Hi Josh, great to hear from you, and glad you’ll be coming to Bangkok soon. I will get back to you by email. Hello Mark! Would you happen to know if this place, Mit Ko or P’Aor use any pork oil or lard in their cooking or tomyum? Thank you so much. Hi Anna, they shouldn’t in their tom yum, but in any stir fried dishes it could be possible. 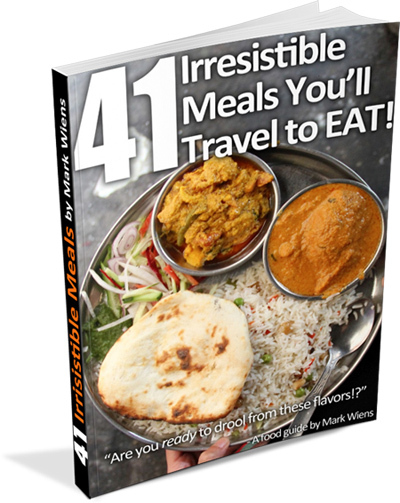 Hi Mark, I’m a huge fan of yours and have been to many of your recommended eateries. However, I went here with one of Thai friends and the tom yum goong was very sour and not at all creamy. Do you need to specifically order the creamy version? Hi Karl, good to hear from you. For their version of tom yum goong it’s usually quite sour, and they don’t add anything other than the shrimp for creaminess. So it depends how creamy the shrimp are that determines the creaminess of the soup – so it was probably due to the shrimp that day. Hey Karl, no problem, hope you can give it a try again. I am visiting Bangkok soon and am staying near Ratchathewi BTS station. What is the way to get here? 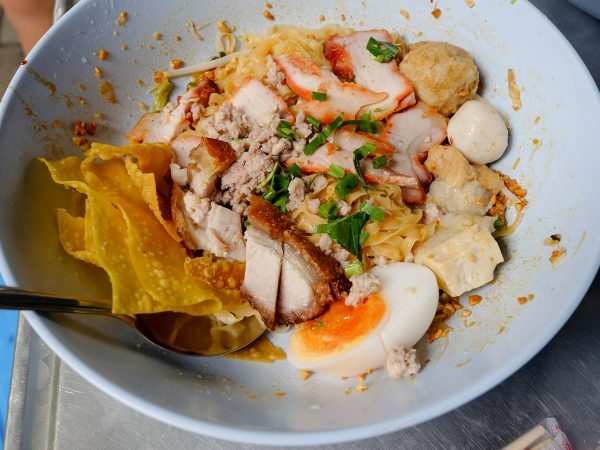 Sorrry for the multiple comments, just additional question do you know where I can get good “Goong Chae Nam Pla” in Bangkok? Hi Danny, best way to get here would probably be to take a taxi from where you’re staying, or you can take the Khlong Saen Saeb ferry boat, then walk towards Banglamphu. We are big fans of your youtube channel. Good job! We will visit Bangkok this May and would like to visit this place. Is it closed on Monday? Hey Frank, on Monday they are supposed to be open only in the evening due to Monday morning street cleaning. But probably best to choose a different day than Monday if possible. Have a great upcoming trip to Bangkok! Sad day; last one in Bangkok before flying home in the morning. Just staggered out of TYGB – absolutely sensational ! Made a ‘mistake’ and ordered two bowls of Tom Yum Goong. Wasn’t expecting the portions to be so big but….. what a mistake ! Sensational perfectly cooked prawns; still soft as you said due to very little cooking. So fresh – really high class food for a place on the street. Also went for Pad Pak Kana but with Moo Krob ( crispy pork ) addition – left us speechless ! Final dish was Pla Tod. As there’s no menu this was just an impulse order as I saw some great fish steaks being fried up. Was served in a delicious aromatic sauce containing around 8 million basil leaves. Enormous portions; I’m sat Soi Rambuttri in the shade trying to digest as I type ! Not sure when we’ll be back in Bangkok but I hope it’s soon…. The tom yum goong was excellent. In fact this was my first ever taste of tom yum goong. It looked fairly plain but the sourness and the spiciness of the soup felt pleasantly shocking on my first sip. And I would like to add one more thing. I finished my meal @6:40pm and the place was still buzzing. People came in and placed fresh orders. I guess you can update the timings. Well…… it’s been a year but we’ll be back in Bangkok in 4 weeks time ! This place is very close to where we are staying on Rambuttri and is now definitely on the hit list. Thanks for posting the 2 weeks in Bangkok series recently – really informative and it was great to watch and spot places we knew. Hey Andy, thank you very much, and glad you’ll be coming back to Bangkok soon. Hope you enjoy this tom yum goong, I think I prefer it over P’Aor as it’s less sweet, and little more rough. Thank you so much for your support and hope you have a fantastic upcoming trip! Finally had the chance to make the creamy version last night. It was fantastic! My whole family loved it. We will definitely make it again! Many thanks. Good to hear that Carl, glad you enjoyed it! This should on the list of one of the best tomyum in Bangkok. Reading someone highly recommend “goong tod gratiem” on P’Ying’s facebook page 2 days ago make me want to try that too. Hey Kitti, yes I really need to go back and try the good tod gratiem, it looked so good! I shared five dishes here and it was all good. really busy but going again soon. I think maybe best tom yum too. Hey Chuck, good to hear you ate here too. Did you try the “goong tod gratiem” (shrimp fried with garlic)? Glad you enjoyed this spot! You had me at hello, Mark. Will definitely try next month.